DevOps, DevOps, DevOps. In 2014 DevOps hit the top of the charts in IT lingo. A recurring question that tags along is: can DevOps be applied in traditional enterprise settings? For this eMag we selected a set of articles that dig deeper into this debate and contextualize the benefits and challenges of DevOps adoption in a traditional enterprise. 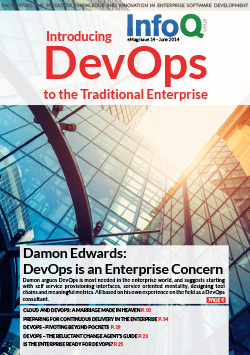 Damon Edwards: DevOps is an Enterprise Concern - Damon argues DevOps is most needed in the enterprise world, and suggests starting with self-service provisioning interfaces, service oriented mentality, designing tool chains and meaningful metrics. All based on his own experience on the field as a DevOps consultant. Cloud and DevOps: A Marriage Made in Heaven - What is the relationship between Cloud Computing and DevOps? Is DevOps really just “IT for the Cloud”? Can you only do DevOps in the cloud? Can you only do cloud using DevOps? The answer to all three questions is “no”. Cloud and DevOps are independent but mutually reinforcing strategies for delivering business value through IT. Preparing for Continuous Delivery in the Enterprise - In this article you will find guidance on how to get started realizing a Continuous Delivery vision, especially in the context of existing development and release environments in large enterprises. DevOps - Pivoting Beyond Pockets - Traditional Infrastructure Operations roles are no longer scaleable. The traditional system admin or the network engineer or the engineering roles such as storage engineers are rapidly changing. The difference between a developer and operations engineer are becoming more and more invisible and will eventually dissolve. This is part of a massive shift in the IT Infrastructure Industry. DevOps – The Reluctant Change Agent’s Guide - Agile and DevOps people talk a lot about what to do when they want to encourage change – “Form a self-organizing team”, “Break down silos”, “Automate everything”. But people talk a lot less about how to achieve these good things, the enablers. Frustratingly, logical arguments don’t always win, that’s when it’s good to possess a few of the change agent’s skills. Is the Enterprise Ready for DevOps? - As the DevOps movement gains popularity enterprises have started to adopt its concepts and tools to manage large infrastructures and complex delivery processes. InfoQ asked some experienced DevOps adopters about the organizational and technical obstacles still ahead for the movement to step into the enterprise world.